In Medieval times, people concentrated mainly on the church, God, and the eternal life. Life in Medieval Italy was primitive and far more difficult than that of Imperial Rome. Barbarians ran rough shod, frequently putting entire villages to the torch and enslaving the survivors. Christianity provided an ethical element lacking in previous cultures. In a society of almost complete illiteracy, constant outbreaks of plague, smallpox, leprosy, and the ever present threat of starvation, the beauty of art and architecture was a true sanctuary. Society was subjugated by a single, uncompromising, restrictive religion which encouraged conformity. Medieval historian, Hendrik van Loon, describes the average peasant "They were savages who lived amidst glorious ruins but who did not share the benefits of the civilization which their fathers and grandfathers had destroyed. They knew nothing. They were ignorant of almost every fact which a boy of twelve knows to-day. They were obliged to go to one single book for all their information. That was the Bible. But those parts of the Bible which have influenced the history of the human race for the better are those chapters of the New Testament which teach us the great moral lessons of love, charity and forgiveness." Life was brutal and grimy and this is why the average peasant was overcome with devotion and wonderment upon entering the local church and seeing a magnificent altarpiece or statue. Italian Medieval painters were not simply anonymous lowly craftsmen, but well respects professionals. They were the rock stars of their day and regularly interacted with Popes and royalty. Many lived fascinating and occasionally disreputable lives. They were the subject of gossip and innuendo. 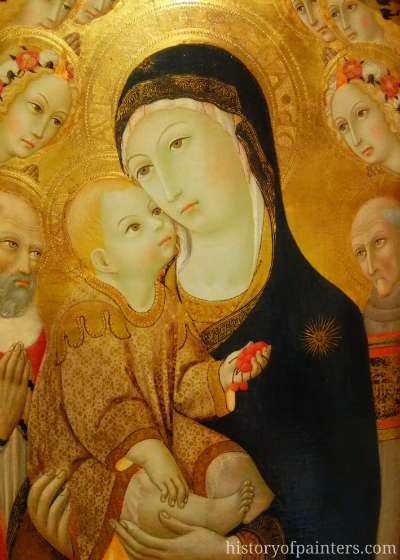 Italian paintings from the Middle Ages were darkly mystical, infused with an ethereal emotional intensity. 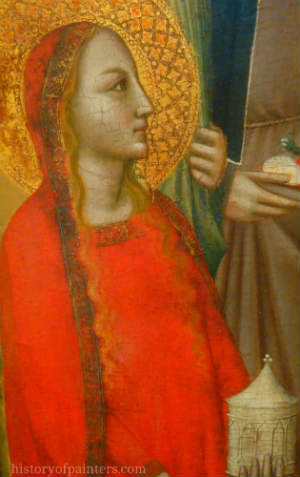 The mysticism of the Medieval period imparts a sense of uniqueness and wonder to art. Italian Painters from this time period had a taste for the supernatural and their use of symbols are mysterious hints and glances into the shadowy religious world that lay behind the grinding reality of the times. The style is distinct and clearly different from the heavy Renaissance art produced in in later generation. Medieval painters in Italy imparted to their pictures an orderly and elegant element and a splendor of color and gilding that recall art of the Carolingian period. Paintings from this period are incredibly mystical, and completely enchanting. Artists were innovative and produced works of great beauty and wonder. As time went on the style of painting was a reflection of the transformation that was taking place in Europe, the change from the unjust feudal system to a more enlightened, just society.